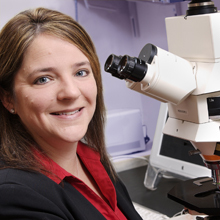 Christa Lese Martin led the Emory site of a national clinical trial showing chromosomal microarray is a more definitive method of prenatal testing than current karyotype testing. A clinical study of 4,400 women undergoing prenatal diagnosis showed that testing with chromosomal microarray analysis detected additional chromosomal deletions and duplications not detected by G-banded karyotype, which is the current standard of care for patients undergoing invasive prenatal testing. Microarray analysis provides a more comprehensive examination of a fetus's DNA than karyotyping, which involves only visual analysis of the fetus's chromosomes. The study results are published in the Dec. 6 issue of the New England Journal of Medicine. The study included samples from women at 29 centers nationally, and the data was analyzed over four years. Indications for prenatal diagnosis were advanced maternal age, abnormal result on Down syndrome screening, structural anomalies on ultrasound and other indications. Standard karyotyping was performed on all the samples at Integrated Genetics. In addition, part of each sample was processed and analyzed by one of four chromosomal microarray laboratories, including Emory's Cytogenetics Laboratory. The other laboratories were at Baylor, Columbia University and Signature Genomics. Ronald J. Wapner and colleagues at Columbia University Medical Center led the study. Microarray analysis, which compares a fetus's DNA with a normal DNA, was just as effective at identifying common aneuploidies (an abnormal number of chromosomes). An extra or missing chromosome causes genetic disorders such as Down syndrome. Microarray also identified additional abnormalities that were undetected by karyotyping. In cases that had a normal karyotype, microarray analysis found clinically relevant chromosome imbalances in six percent of pregnancies that had a structural abnormality already detected by ultrasound and in almost two percent of pregnancies referred for advanced maternal age or positive screening results. "If these couples had only had a karyotype, they would not have gained important information about the health of their fetus," says Christa Lese Martin, director of the Cytogenetics Laboratory within Emory Genetics Laboratory and principal investigator for the Emory site in the clinical trial. The research was funded by the Eunice Kennedy Shriver National Institute of Child Health and Human Development of the National Institutes of Health (NCT01279744).